Do you feel self conscious of your smile because of the appearance of your teeth? Settling for basic oral care is not going to transform your appearance. For that, you would require an effective dental treatment that prevents future dental problems and dental solutions to regain your lost smile. Parabanks Dental contains a team of some of the finest and highly professional dentists in town that strives to provide the best possible solutions to our clients. There can be nothing worse than not being able to smile. Stop hiding your teeth and get an effective and long lasting solution of your problems now. To provide to you our services in the most convenient way, we have expanded our availability and serving various areas such as Elizabeth, Parafield Gardens and Hollywood Plaza. We also have parking facility for our clients. Our dentists are very friendly and ensure that you are fully comfortable during the checkups. They are expert professionals and know the techniques to minimize your pain. 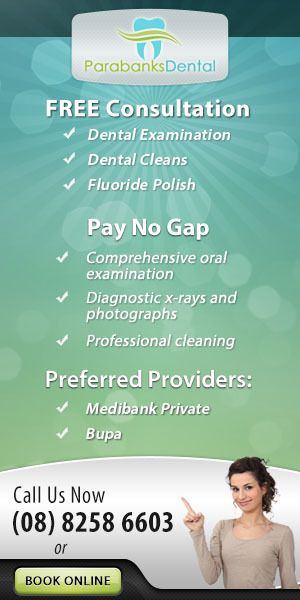 We offer affordable dental services for individuals as well as families which can be tailored as per the requirements. We are always there to cater to your needs. You can call us for emergency dental treatments as well. Apart from providing private dental care, we provide public dental care as well to serve our community. We are a BUPA and Medibank Private preferred practice and offering higher rebate on most of our private services that we provide within our clinic. We not only aim at improving your oral heath but overall heath so that you can enjoy your life with healthy and beautiful smiles. Visit our dental clinic for your various problems and let us handle the rest.